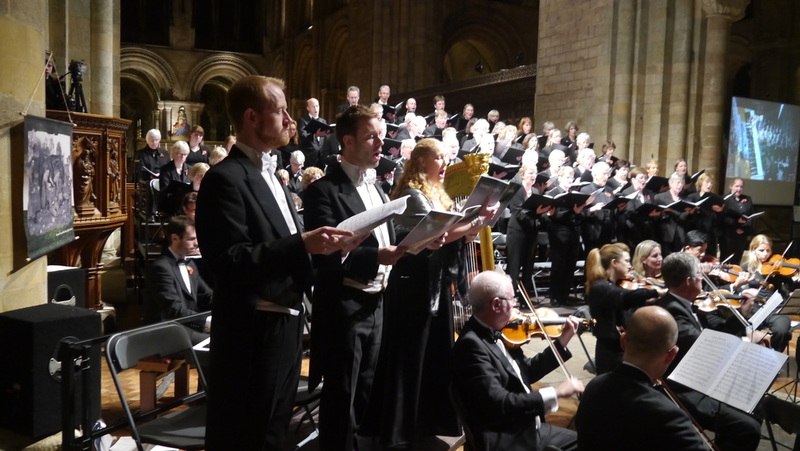 Saturday’s sell-out concert in a packed Romsey Abbey was a triumph for Romsey Choral Society. Conducted by the internationally renowned composer and media personality Howard Goodall, the programme honoured Remembrance Day and included three pieces on the theme of “light”. The concert opened with American composer Morten Lauridsen’s ecstatic setting of James Agee’s poem, Sure On This Shining Night. Accompanied by just a piano, the singing was confident and well-blended, the men-only sections being especially effective. The consolatory mood set by this work was continued and developed in Lauridsen’s longer work, the meditative Lux Aeterna. The choir had been exceptionally well-prepared by their Musical Director, Jamie W. Hall, and so were able to respond well to the enthusiastic demands of their celebrity guest conductor. Goodall shaped the somewhat wandering music well, giving it direction through clearly defined climactic moments and a wide range of dynamics. He was ably supported in this by the excellent Newbury-based professional orchestra, Southern Sinfonia. 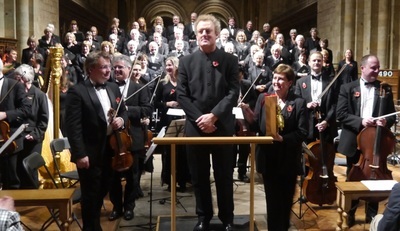 In the second half of the concert Howard Goodall delivered a comprehensive introduction to his own work, Eternal Light, describing it as “a requiem for the 21st century”; providing consolation to the living rather than prayers for the dead. Eternal Light is populist in the best sense of the word and Goodall draws on the familiar, including English poetry and Biblical references, and gives it new life. Originally conceived in 2008 as both a choral work and a ballet piece, the influence of dance can be heard throughout, by means of its strong rhythmic sections and flowing lines. A particularly challenging section involves words from the Book of Revelation set to a relentless, mechanistic rhythm, yet the choir managed this well. Soloists Emma Scott-Copeland (soprano), Nathan Vale (tenor) and Jamie W. Hall (baritone) were entirely engaged with the mood and message of the work and sang throughout with sincerity and warmth. The climax of the work is a complex and demanding recapitulation of some of its strongest melodies, including the emotionally charged hymn, “Lead Kindly Light”; nevertheless, the choir sustained energy right to the end, singing with real commitment and joy. As tumultuous applause rang out at the end of the concert, with graceful generosity, Howard Goodall brought forward RCS Musical Director, Jamie W. Hall, to share the appreciation.